Sports Editor David Oliver wonders if there was a hidden camera show being filmed at Dunfermline’s expense on Saturday during the Bairns’ vital 1-0 win in the SPFL Championship. Was Nick Hancock or Danny Baker in the crowd at East End Park? Perhaps that would be reason for some of the freakish misses witnessed in Falkirk’s win. 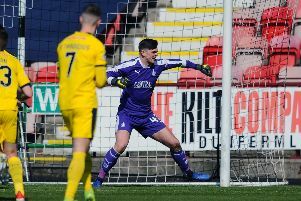 Harry Burgoyne reckoned there may have been some divine intervention, but just how Dunfermline conspired to pass up some of the chances they did is anyone’s guess and after a week of misfortune, Lady Luck shone on the Bairns and has given Falkirk a chance. It was a literal comedy of errors. A re-run of some of the own goals and gaffes videos that filled Christmas stockings in the 1990s. Laughable. Falkirk provided the errors, Dunfermline the comedy. Thankfully Pars couldn’t hit the proverbial cow’s with a banjo – though Myles Hippolyte managed to find Ciaran McKenna’s and Burgoyne used his to stop Bruce Anderson in the first half. Come the end of the 90 minutes, it was bottoms up and off the bottom for the Bairns. But it was almost not funny. At all. Quite the opposite in fact. The Bairns could have been laughing on the other side of their faces as McKenna conceded a penalty to Bruce Anderson, only for grimaces to turn to grins with Burgoyne’s big save. McKenna also hit the post with a chested backpass and slipped and slid at crucial points. It could have been costly, but as Burgoyne said, someone somewhere was looking out for them. The young defender was put through a test of character, confidence and concentration, and he’ll be better for it. The Bairns are all better for this win. 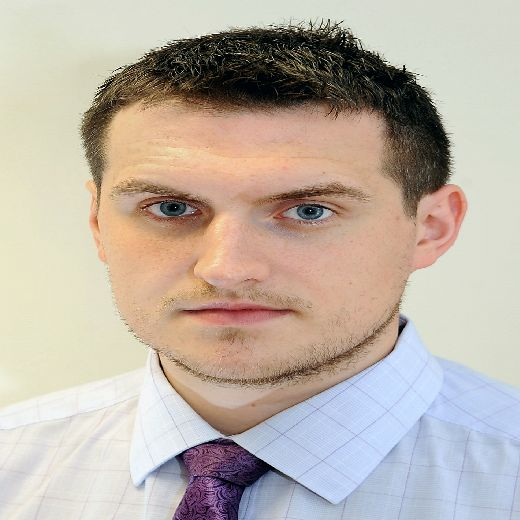 It’s far from settled, but three points from Fife and a similar return this weekend will go a long way. But boy were they lucky. In every aspect barring the goal which was well deserved in the move of the match. Prior, Falkirk had lumped long balls forward seeking Zak Rudden’s knockdown for Aaron Jarvis, and vice-versa. It was a tough watch and ineffective. 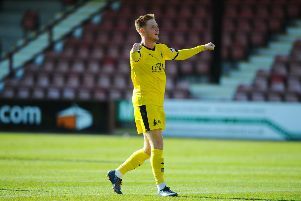 Two up front was welcome but until the guile of Davis Keillor-Dunn exploited the pockets of space as a second half substitute did Falkirk begin to threaten. Rudden’s clever backheel into his path laid on the opportunity and he tucked away a chance that was trickier that many of those Dunfermline bounced off players, posts or whatever else they could aim at outwith the goal. It handed Falkirk a second win of the season at the home of their rivals – and as many they’ve won at home this term too. It was well worked but the element of luck can’t be discounted, nor relied upon. More is now needed, a repeat result against Morton and then some to ensure a return to East End Park next season for more of the same. It was an enjoyable win, the Bairns left smiling and chuckling at the prolifigacy they had just seen, and thankful that they could. Because if they didn’t laugh, then they’d cry.